The Three Axis Platform is the answer if you need real flexibility in a mount. 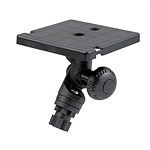 With two swivel points and a tilt adjustment you can easily rotate, tilt and change the view from landscape to profile. Designed with sounders and GPS in mind, you can now view from any angle. The Three Axis Platform can be mounted on vertical or horizontal surfaces, but really comes into it's own if you have a sloping surface and need your display on a different angle. Supplied with a 102mm x 102mm (4"x4") platform made from high density polyethylene, fixing items to it can be as simple as screwing a self tapping screw directly into it.